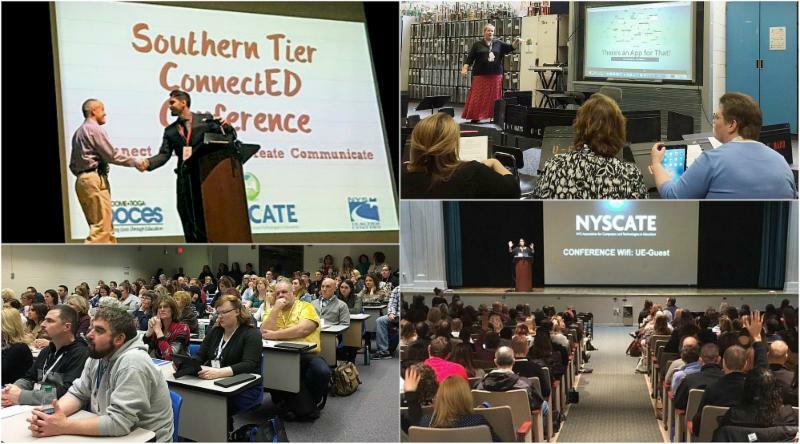 The March 2017 Superintendents’ Conference Day marked the 3rd annual Southern Tier ConnectED Conference , a collaboration between Broome-Tioga BOCES, NYSCATE, and The Southern Tier Teachers’ Center Network. A BIG THANK YOU to Union-Endicott High School for hosting this year’s conference and accommodating not only record-setting attendance of over 850 educators, but also providing space for 73 tech-integrated sessions for attendees to participate in throughout the day! The day was kicked off by keynote, Dr. Robert Dillon, who inspired a captive audience about “The 5 Myths in Public Education.” After the keynote, attendees migrated to workshops to explore, create and contribute to topics like APP-y Hour, Augmented Reality, Coding & Classroom Learning, Easy Video Creation, Elevating Writing and Literacy Skills with Technology, Inquiry-based Learning, Learning Spaces, Robotics, and student-facilitated sessions on Discovering Costa Rica through PBL and Breakout EDU. We are excited to prepare for next year’s conference. Mark your calendars for March 16, 2018! 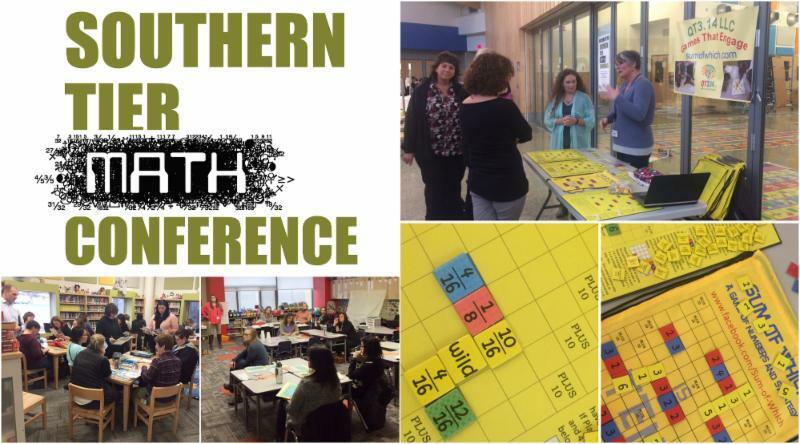 Approximately 150 educators from around the area attended the second annual Southern Tier Math Conference at Binghamton's MacArthur Elementary School after school on March 9th. 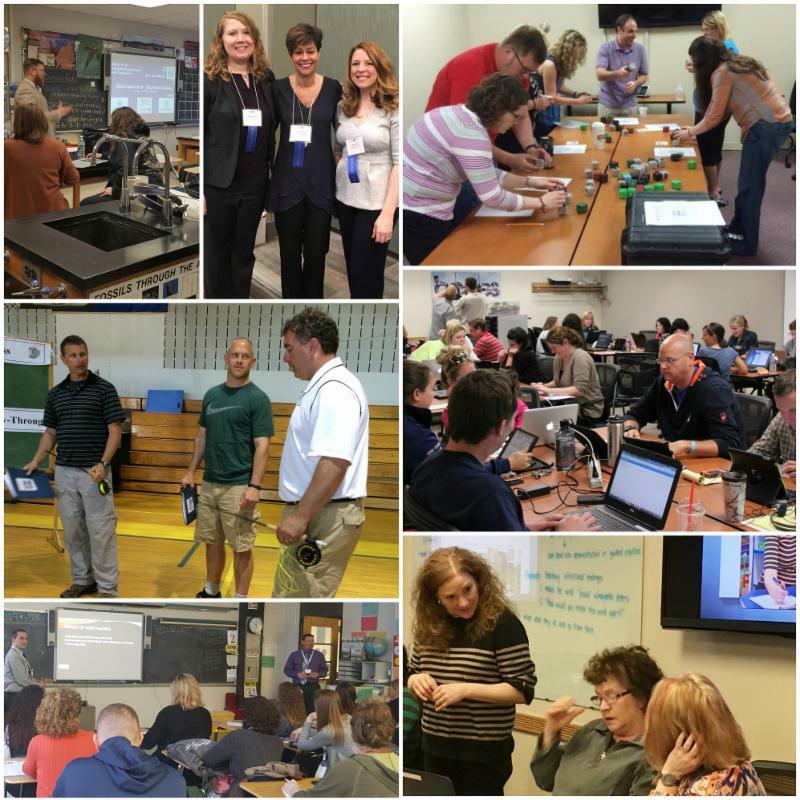 There were over 20 presentations that participants were able to attend including Model without the Mess, Discovering Desmos in your Classroom, Video Creation for the Non-Techie, Breakout Edu, Math in Movement, and Algebra II CC Review. Participants had the opportunity to view products from WSKG, Lakeshore Learning, Zearn, Triumph Learning, and Eureka Math. Teachers also had the chance to collaborate with colleagues during refreshments, and win raffle prizes donated from the vendors! The feedback received so far has been nothing but positive. We extend our thanks to Binghamton City School District and MacArthur for the use of their facilities, The Master Teacher program of NYS for their generosity, Broome County Teacher Center for advertising the conference, the vendors WSKG, Lakeshore Learning, Zearn, Triumph Learning, Eureka Math, and the presenters for relaying valuable information. Finally, a big thank you to all of the conference attendees, because without you this conference would not be possible! Have you ever wanted to play a bunch of bananas like a piano? What about use a video game controller made from Play-Doh? Makey Makey allows you to take everyday objects and combine them with circuitry and the internet to create fun projects! Using the alligator clips attached to any conductive material, you can control the keyboard of your computer, such as the space bar, arrow keys and left click of the mouse. Once you’ve mastered the basics, the Makey Makey allows you to go even farther: experiment with conductivity, combine the Makey Makey with Scratch coding, and connect with people all over the world to invent and share your own electronic projects. To borrow, visit http://webmax.stier.org .